We recently had our eyes on an 84 Isuzu Pickup Diesel 'survivor' car, but the buy-it-now was insanely high and the auction was ended early (probably sold off ebay). 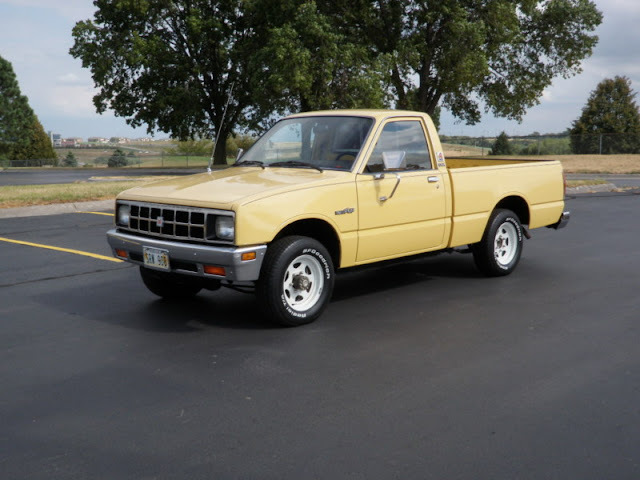 But no one really wants a glacially slow oil burner from the 80s - so we found this 1983 Isuzu Pickup with manual trans and gasoline engine, in Omaha, NE currently bidding for $5k on ebay reserve-not-met. In an alternate universe - there is a Batman. He is still Bruce Wayne, but he wasn't born to millionaire parents. His parents couldn't even afford a standard Gotham apartment, they were forced to live in a double-wide in East Gotham Heights. But Bruce couldn't be stopped from pursuing his dreams of fighting crime and avenging his parents' death. So he saved his money from working day shifts at the local Afredo's Pizzeria and bought a '60s muscle car, 4 buckets of fiberglass resin and a lot of black paint. 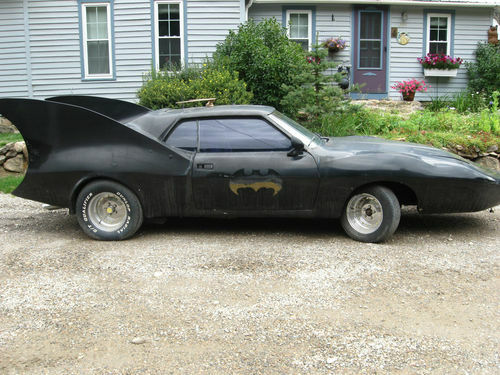 His 1972 AMC Javelin Bat-some-what-mobile is now for sale on ebay currently bidding at $664 no reserve with 3 days to go. Thanks to tipster ~Scot for today's riddler! We featured a 3rd generation Toyota Corona on Wednesday - a restored, nice looking example that had some money put into an 'out of body experience' restoration...but for those who like their classic Japanese iron with some patina on it - we've found a nice original one for you. 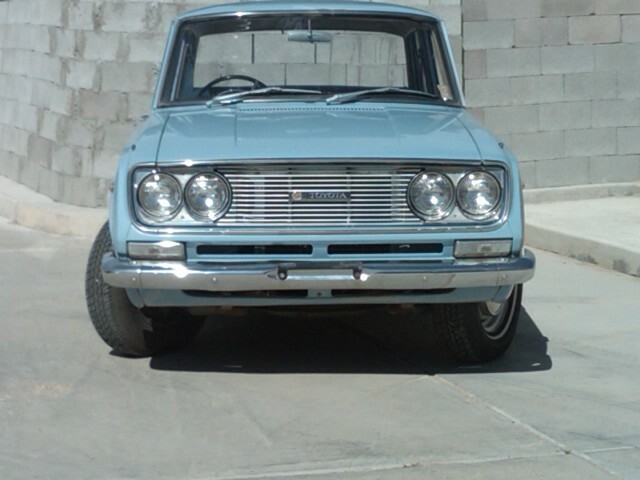 This 1966 Toyota Corona for sale in Santa Fe, NM, on ebay is an overseas right-hand-drive version and currently bidding at a reasonable $3150 with no reserve. Considering that the last Amazon (aka 122) that we featured was a clean original coupe and sold for $8650, a nice wagon could conceivably be worth a similar amount. Today's 3rd Thorsday car is a partially original, partially restored family truckster in a fetching shade of blue with nice contrasting red painted "V" hubcaps, a decent interior, and some needs. Perhaps the seller is a bit optimistic on price, but it's listed here on Hemmings Classifieds in Clifford, PA for $9000 or best offer...wonder what that will be? Two days before Thorsday we posted an ad for a nice looking '67 Amazon coupe -- and DT reader/commenter Clark picked it up for what we think was a great price. His words: "I also thought it would go a bit higher. That it SHOULD go a bit higher. With a minute or so left in the auction I threw out my first bid to bump up the price to where I thought it should be, and wouldn't you know - I just bought myself a Volvo! I'd been watching the bidding from the beginning without bidding. With about 20 minutes left my wife, bless her heart, said, "You should bid on it!" This one will replace the '63 122 beater I had to sell years ago. I'm looking forward to picking her up and perambulating back to Austin, Texas." This car has to be one of the most well-traveled Volvos in recent memory - on the internet anyways, regardless of its miles in the real world. It has been featured on Bring a Trailer and the Hemmings blog, having last been sold about 3 years ago. The list of upgrades is long, the price is reasonable, and we would be surprised if it wasn't a hoot to drive. 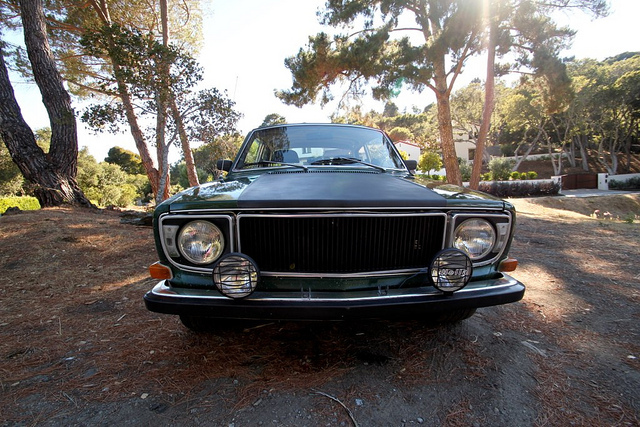 This 1972 Volvo 142S is available on ebay in San Mateo, CA for $3400 Buy it Now, but bidding still active under the reserve. 5k: 1963 SAAB 96 -two stroke! Welcome to the highlight of the week here at Daily Turismo headquarters -writing for Thorsday, in a bunker, surrounded by pictures of Volvos and our soon to be priceless "The Simpsons" stamp collection. Last Thorsday we posted a SAAB 96, but it was powered by a silly V4 engine, but any real Saabälskare will demand the sights/sounds/smells of the 3-cylinder 2 -stroke SAAB. 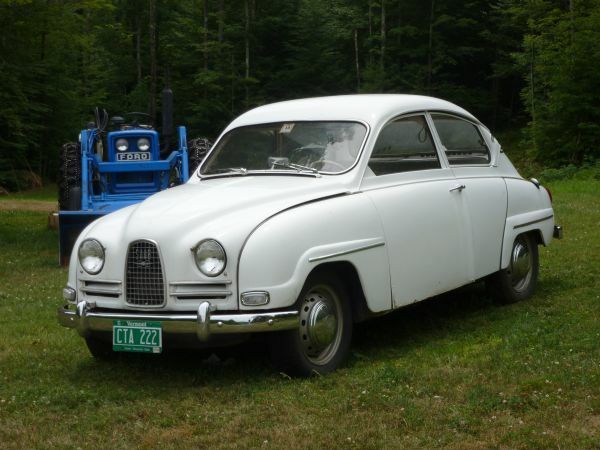 This 1963 SAAB 96 is powered by a 2 stroke engine, for sale in Athens, VT for $5k asking, via craigslist. "Pro-Street" is a term often tossed around by grey-mustached dudes at car shows and many different definitions are probably correct. Roughly stated - Pro-Street was a style of hot rod started in the 1980s that involved turning a street car into a street/strip/show car. A proper Pro-Street needs big wheels in the back, lots of chrome and lots of go. 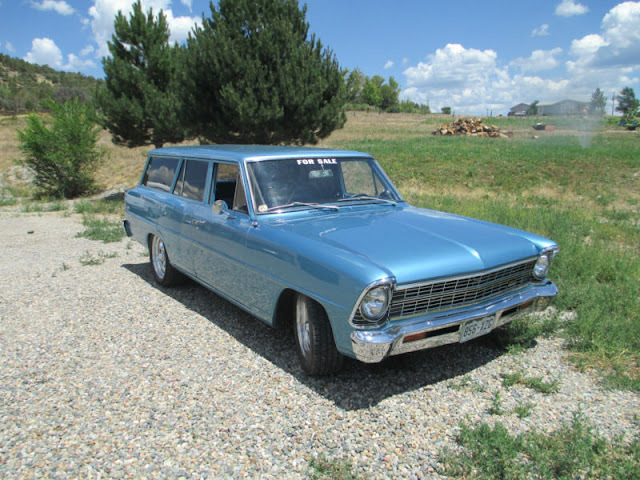 This highly modified 1967 Chevy Nova Wagon is advertised as a 'Pro-Street' car and is currently bidding at $10,606 reserve-not-met on ebay, located in Bayfield, CO.
We will try to refrain from making any Smurf jokes about this car. Not even one smurfin' joke (okay, maybe just that one). What we have here is an interesting beast - a claimed "GTV-AM" model. We are not Alfa snobs, and not sure that such a variation even existed - but perhaps it is a tribute to the GTAm factory race cars built for the European Touring Car Championship series. Regardless, the widebody flares and tricolore Italian stripes make us want to spill our espresso and casually wave "ciao" as we hustle this street-legal beasty past some posers in newer Ferraris and Lamborghinis. It's in New Jersey and is offered here on ebay for $16k Buy it Now. The Chevrolet Corvair was a compact economy car produced during the 1960s, known for its aircooled rear engine setup and propensity for questionable handling. The second generation Corvair fixed many of the suspension woes of the first car - but not before the damage done from Ralph Nader's scathing indictment of the automotive industry put the Corvair under GM's axe - the last one rolling off factory lines in 1969. 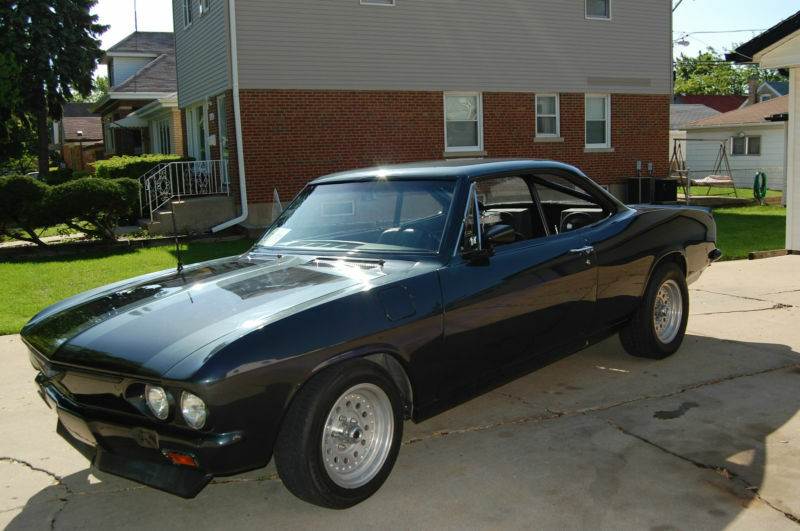 This 1965 Chevrolet Corvair is for sale on ebay in Chicago, IL, currently bidding at $1025 reserve-not-met, but $8k buy-it-now. Are you an aspiring movie producer? Working on a period '60s Japanese flick - maybe a "reimagining" of You Only Live Twice? Can't afford a 2000GT and need a little basic getaway kuruma for the good guys to flog while fleeing from the Yakuza in their sinister black Crowns? Look no further! 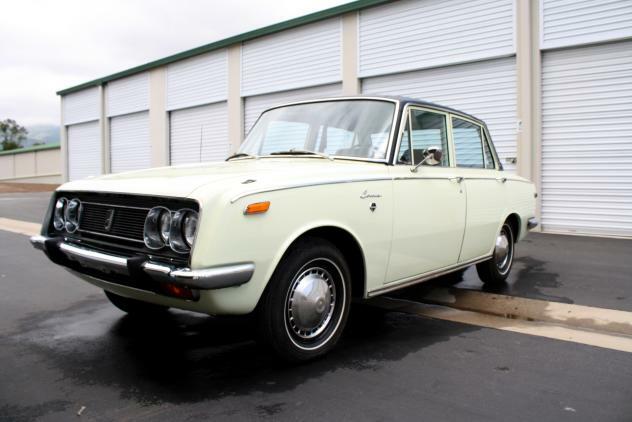 We've found a perfect 1970 Toyota Corona 4-speed sedan, a fully restored example with only 1024 miles on the odometer that will suit the job just fine - even if you're just pretending to be chased by gangsters. It's advertised here on AutoTrader Classics in Santa Maria, CA for only $4900. Hai! It has been 5 days since we've posted a Volvo - please don't let us go that long again - we are having withdrawals. Even though we are Volvoholics, today's little red coupe is also the perfect prescription if you are suffering from a case of Alfa GTV fever, but don't have the cash to cure it with Italian machinery. The Volvo Amazon / 122S coupes feature classic lines, legendary reliability and a certain Nordic charm, while still changing hands at reasonable prices unlike their Milanese counterparts. 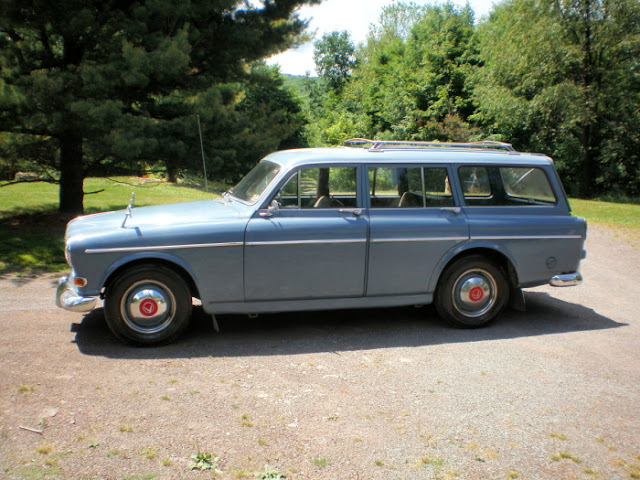 Check out this claimed "all original survivor" 1967 Volvo 122S 2-door in Ona, West Virginia on ebay with reserve met and auction ending tomorrow. The Samurai in Feudal Japan were a class of Warrior-nobles, the word Samurai actually a verb meaning "to wait upon the upper ranks of society." The Samurai with wheels was a four-wheel-drive lightweight from Suzuki - the Miata of SUVs. 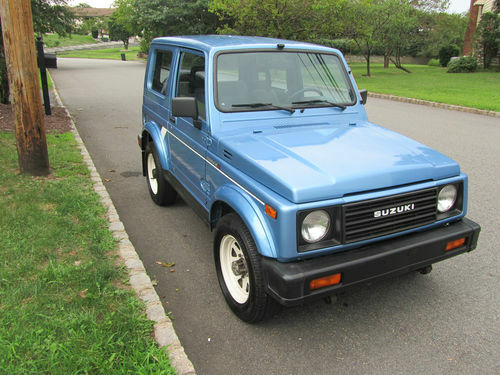 This 1988 Suzuki Samurai is for sale in North Bergen, NJ on ebay currently bidding at $5010 reserve-not-met. Chevrolet introduced the Vega in 1970 as a cheap coupe, hatchback, wagon and panel van. Like a Quentin Tarantino film, the Vega started out with a happy face and to many accolades, but ended with broken dreams, bullet ridden corpses and general mayhem. Ralph Nader once wrote that the Vega was "sloppily crafted, unreliable and unsafe automobile" - which makes us want one a little bit more. 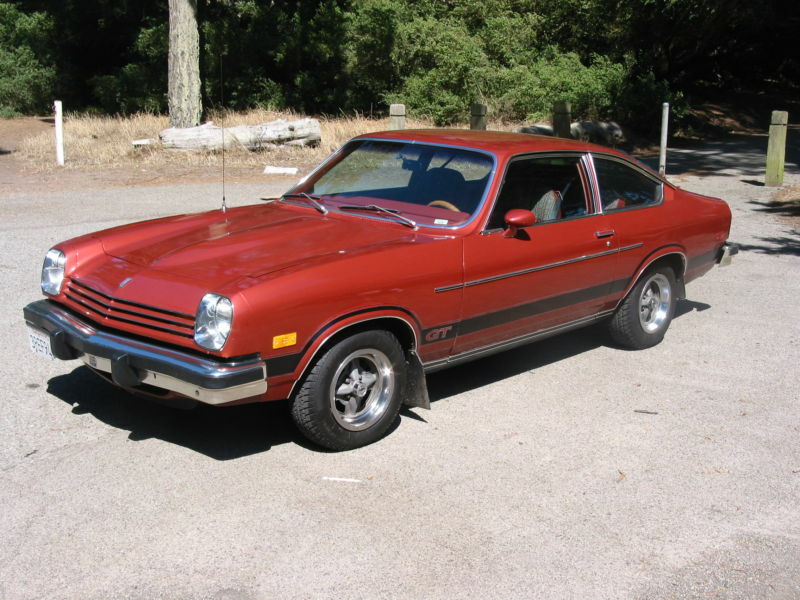 This 1976 Chevy Vega GT Hatchback with 35k original miles is for sale in San Francisco, CA, on ebay bidding at $3050 reserve-not-met. 15k: 1973 Corvette Sports Wagon "Riddler!" The C3 Corvette (1968-1982) wasn't the prettiest Corvette...and by the early 70s it was smog choked slow and shoddily assembled. That didn't stop a team of madmen from Vic's Corvettes in Excelsior, MI from creating a custom breadvan version of the C3 vette. 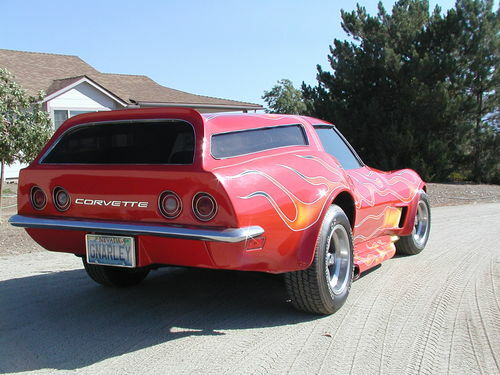 This 1973 Chevy Corvette Sports Wagon is for sale in Gardnerville, NV for $14,500 buy-it-now on ebay. We've featured a non-stock BMW 2002 in the past - but that one was a hacked up El Camino look-a-like Baur Targa -this time we found one much more pleasing to the eye. 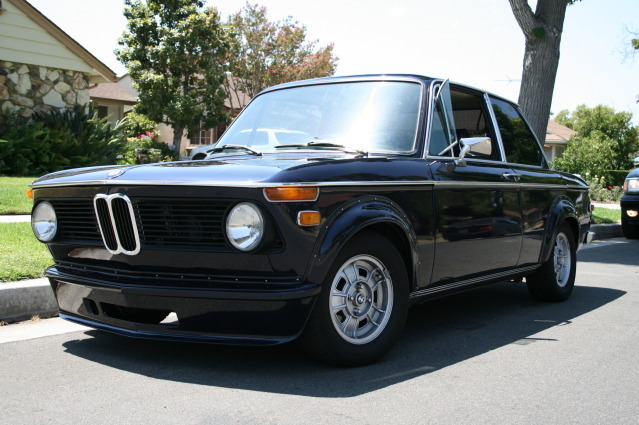 This 1976 BMW 2002 Restomod was originally a big bumpered 2002 - but has now been modified to resemble the Europe-only 2002 Turbo, for sale in Sherman Oaks, CA for $12500. Thanks to tip from DT reader Oscar! The GMC C/K was a range of light duty pickup trucks built from 1960 through 1999. The third generation of C/K series was built from 1975-1987 and is known to be an all around workhorse for yard workers, macho men and survivalists. 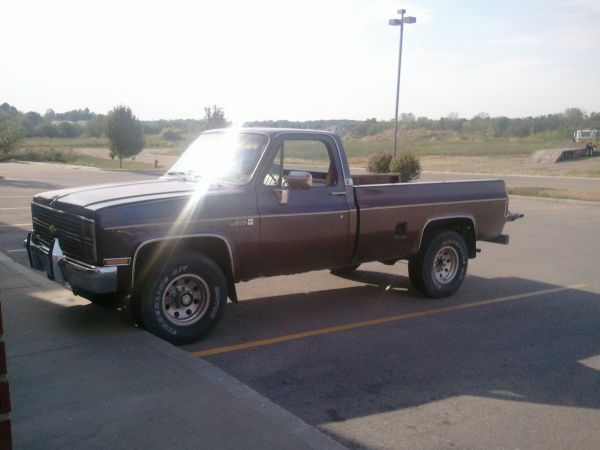 This 1985 GMC High Sierra 2500 was submitted by its seller and is for sale in Lebanon, MO for $3800 via craigslist. The 5th generation Datsun Bluebird was badged as the 610 in the USA. The same car was badged as the Bluebird-U in Japan and at one time used an ad campaign with the phrase "Bluebird U, Up you!". We like the 610 for its funky 70s Japanese vibe and simple light weight chassis. 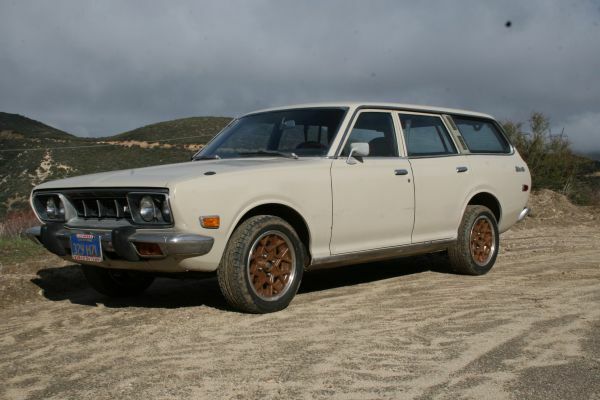 This 1973 Datsun 610 Wagon is for sale in Santa Clarita, CA for $3800 via craigslist. 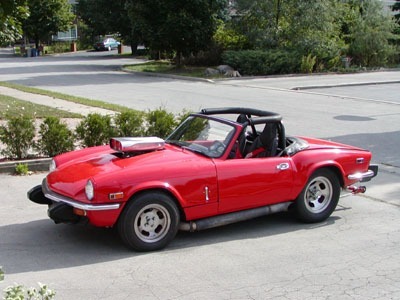 The Triumph Spitfire was a small 2 seat convertible manufactured by the boys in the West Midlands from 1962 to 1980. It was a light, simple, low-power, little roadster that preferred winding roads to drag strips. This 1975 Triumph 1500 has been converted to one that prefers its Christmas trees out of the forest and is for sale in Dunsford, ON, Canada for $8500 CDN via kijiji (Kijijijijijiji is a newer and more cluttered looking version of craigslist - launched by ebay in 2005) (Thanks to DT reader Paul R for the tip!). 5k: 1970 SAAB 96 V4! 10k: 1973 Ford Gran Torino - Dude. DT Success Story - Thorsday Throwdown!